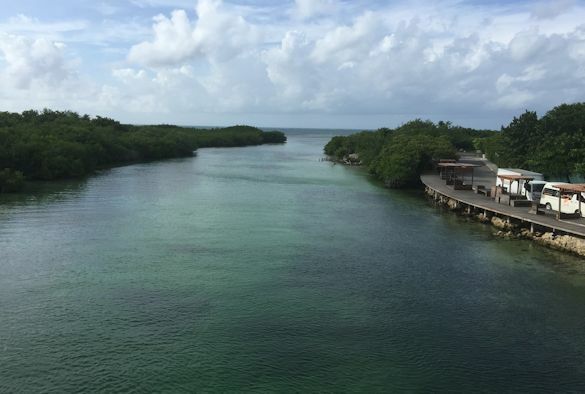 “We couldn’t believe our luck when we were offered the opportunity to travel to Puerto Morelos, Mexico, to take part in a two week course on the hydrodynamics of estuaries and lagoons. As PhD researchers in coastal resilience, based jointly in both the Department of Geography and Planning and the National Oceanography Centre, our interests lie in physical coastal processes with a focus on mitigating flood hazard. This study abroad opportunity arose as part of the Global Innovation Initiative project between the University of Liverpool, National Oceanography Centre Liverpool, University of Florida and Universidad Federal de Pernambuco (Brazil), which aims to quantitatively assess salt intrusion into estuaries, from sea-level rise, storms and changing rainfall and runoff. One part of this was the project’s summer school, with participants taking from the US, Brazil, Colombia, Peru, Chile and Mexico. 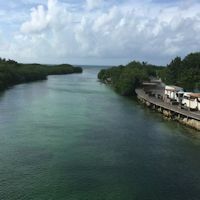 This small fishing village on the east coast of the Yucatan peninsula is home to the Institute of Coastal Science and Limnology, National University of Mexico. Located on the beach overlooking the Meso-American Barrier Reef, extensive seagrass beds and previous mangrove forests – we couldn’t ask for a better venue! 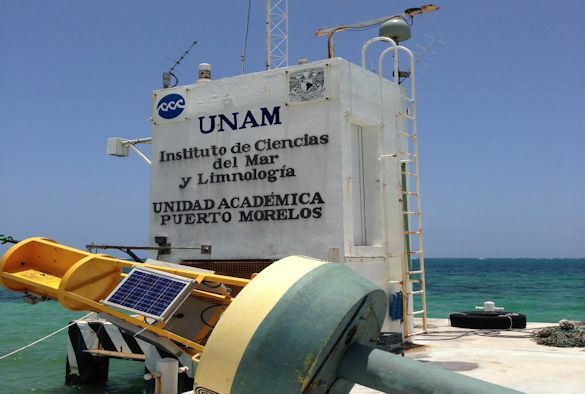 On arrival, we were quickly introduced to the concept of 24 hour field work to capture hydrodynamic data at Nichupte Lagoon, Cancun over a 24 hour tidal cycle. We were deployed to the field in 6 groups over 24 hours, with the task of dropping a conductivity-temperature-pressure probe from a bridge to the bottom of the lagoon every five minutes, being sure to avoid passing boats and fishermen. On day one of data analysis and we were thrown in at the deep end with momentum, advection-diffusion, friction equations and more mathematical notation than we had ever been exposed to before. This has only made us more determined to hit the books hard and study to ensure that we can bring more to the table than just our knowledge of tides, coastal processes and morphology. Our evenings are spent running loops and writing code to analysis the data collected from Nichupte Lagoon, as well as data collected in the Mersey Estuary using similar methods, to present in groups. In addition to this, a rap or poem about the key concepts of hydrodynamics in semi-enclosed water bodies will provide light relief to the data analysis at the end of the course.